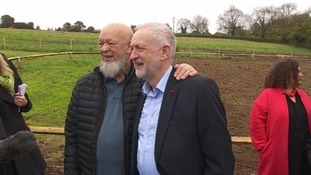 Michael Eavis has welcomed Labour leader Jeremy Corbyn to Pilton to celebrate the beginning of the final stage of his landmark social housing project. Glastonbury Festival founder Eavis' aims to have 50 social houses built in the village where the festival is held. Completion of the homes will coincide with the festival's 50th anniversary. Mr Eavis helped to open 13 new houses in Pilton, Somerset on land he donated, adding to 22 homes built previously. He also announced plans for a further 15 homes to be built. These are houses for village people to live in and they will never be sold. Eavis' project began in 1990 with 10 houses, followed a decade later by a further 12, with another 13 houses now completed. My dream was to have 50 houses available for the festival's 50th anniversary in 2020. Today, we are one step nearer to making that dream a reality.